Board the Star of Honolulu, Oahu's premier dinner cruise liner, for the best ocean-side view of the New Year's Eve fireworks that will light up the sky over Waikiki. With gourmet dinner options, complimentary party favors and live entertainment, this cruise is expected to sell out fast. Book today to secure your seat for one of Hawaii's most famous seasonal attractions, and welcome the new year with incredible memories. Seated at a private table in the "Super Nova" room, the upper-most luxury dining floor, you can enjoy the best ocean view of the fireworks while savoring a 5-course French style dinner prepared by one of the finest chefs in Hawaii. The sounds of live jazz will fill the cabin, creating an atmosphere of elegance and celebration. Dinner: An expertly prepared 5-course French style menu, Live Maine Lobster & Prime Tenderloin of Beef. Beverages: Each guest will receive a sparkling wine toast and super premium beverages. After-dinner drink cart service is also provided. Mmm! A delicious dinner of steak and lobster. Get closer to someone special in the Star of Honolulu's private lounge area. Live jazz combined with a seasonally-inspired 5-course dinner menu and premium cocktails will put you in the perfect state of mind to welcome the new year under brilliant flashes of color. Find the perfect balance between fun and sophistication with a 3-course celebration dinner and live Hawaiian entertainment in the Star of Honolulu's main seating area. With a casual atmosphere, this option is great for families. Dinner: An expertly prepared 3-course menu featuring whole Maine lobster and tenderloin steak. Beverages: Each guest will receive a sparkling wine toast and a premium beverage. After-dinner drink cart service is also provided. Enjoy your new year’s eve party with delicious dinner and show or jazz, dazzling view along the Waikiki coast line and iconic Diamond Head and New Year’s countdown fireworks over the ocean from 4 decks including an observation deck. 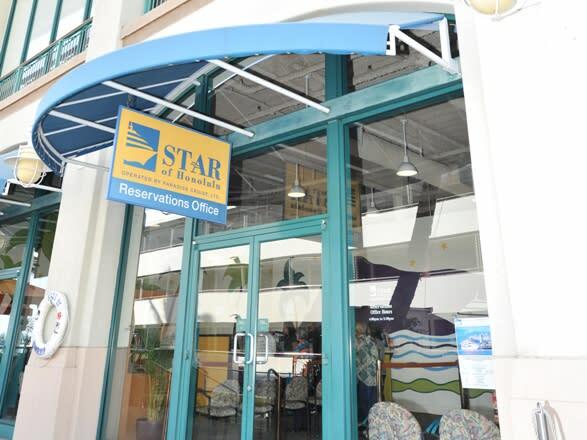 For guests without transportation service: Please check in by 9:30PM at a Reservations Office by the Star of Honolulu. Guests prone to motion sickness may want to take a motion sickness preventative before the activity. Warm clothing is recommended, as the cabin can become quite cool. Dress Code: Shorts, t-shirts, tank tops, swimwear and flip flops are not allowed. Men are required to wear a collared shirt and encouraged to wear dress shoes, slacks and a jacket. Clean jeans are allowed (but not preferred). Women are required to wear cocktail evening attire. Cruise Route: The Captain reserves the right to alter the route depending on sea conditions. The Star of Honolulu is 232 feet in length and can hold up to 1,500 passengers. It has four unique decks and is equipped with three types of stabilizers to provide all passengers with a smooth and comfortable ride. As Hawaii’s only A.D.A. compliant ship, the Star of Honolulu can accommodate guests that other vessels are unable to. The crew of the Star of Honolulu is happy to provide guests with vegetarian, vegan, chicken, and gluten-free options with at least 24-hours advanced notice. Consider taking an over the counter motion sickness preventative before your cruise if you are worried about sea sickness. All-natural ginger tablets are also available on board. This cruise sells out weeks in advance. We highly recommended you book your seats as quickly as possible.